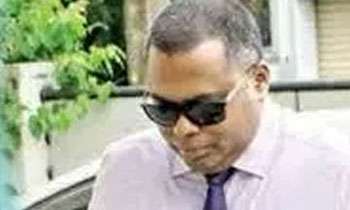 DIG Kaushal Nalaka de Silva who was in charge of the Terrorism Investigations Department( TID) has been summoned to the Criminal Investigations Department (CID) today obtain a statement regarding an alleged assassination plot on President Maithripala Sirisena and former Defence Secretary Gotabaya Rajapaksa, CID sources said. He has been informed to appear before CID Homicide Investigation Unit OIC Chief Inspector Ranjith Munasinghe at 9.00 am today. According to CID sources, the statements has to be taken regarding the bringing of two L.M.G. type guns out of the Police central Weapon Store room for two days as well as regarding the voice recording given by Namal Kumara about the alleged assassination plot. The sources also said that a statement has to be taken from him regarding the disappearance of the sniper gun. It is said that statements had been taken from the complainant, Anti-corruption Front Executive director Namal Kumara on six occasions so far by the CID. Like Gota, he will also come and go. Come and go. If he is arrested, he will be bailed in about an hour. He will again, come and go. Come and go. Sri Lankan law. find out a corrupt judge or pay well to make the judge corrupt,then can do.